Discussion in '[H]ot|DEALS' started by Archaea, Feb 12, 2019. Lowest input lag of any 34” ultrawide. If you don't already have a BeFrugal account you can use my referral link and we both get an extra $10. Fantastic monitor, thoroughly enjoying mine. I believe I got it for around $725 with the 15% off Ebay max $75 back in November from BestBuy. Mine was a revision A06 made in October and I had a 2nd one with revision A05 made in September due to a shipping delay from the BB Ebay store, I ordered a 2nd directly from BB. Definitely the sweet spot for gaming right now with 1080Ti/2080/2080Ti as going to the rumored new formats like 3840x1600 @120Hz or 3440x1440 @200Hz or 3840x2160 @120Hz is going to need either SLI or next-gen GPUs. Just to confirm, the $75 from Dell is a gift card that can be used on future orders, not an "e-coupon" that can be applied to this order, correct? Bummer. I very rarely buy direct from Dell, so don't know when I'd use it. If it was an instant $75 off, this would almost be in impulse buy territory for me just to play around with. Looks like topcashback is offering an additional 12% off, if I read correctly. Guess one could always sell the eGC for $50 or so, which would be almost as nice. I did a quick comparison of most of the monitors from that chart, and I have to agree that the AW3418DW looks like the best one for the money. The 38"s are larger, but tend to top out at 75Hz and are around $1000. Other ultrawides might support 144Hz but are also more expensive and none have input lag this low. This is kind of the best of all worlds, especially at this price. I had the early flat LG 34UM94 and the Dell U3415W, and this blows both of those away by a decent margin. Oh well. Since I already have an LG B7 and only really want something a little smaller with 4K/120Hz support, I might just wait for the 2019s from LG since they will do 4K/120 and are supposed to finally release one in a 40-49" size. That will be perfect for me if it happens, but this is a great deal. If you have an American Express card they are offering an additional 10% off purchases at Dell. Ugh, I sure do. Lol. If I didn't already have a Predator X34 then I'd be picking this up. If this deal lasts until my tax return comes in I am definitely jumping on it. What would you be gaining? According to what I've read, the X34 generally OCs to 100Hz and the 34P to 120Hz. 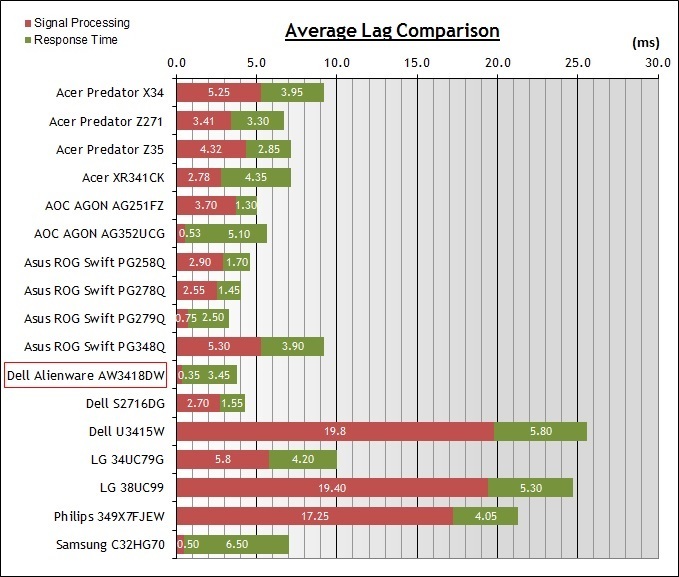 The input lag would probably be lower on this, but a bigger upgrade would be the Z35P or ROG Swift PG35VQ which are supposed to be capable of 200Hz and HDR. Of course, they'll cost more but this seems like sort of a sidegrade for anyone coming from a 3440x1440 monitor that does at least 100Hz. CLEARLY what I'm trying to say is...I misread your post.